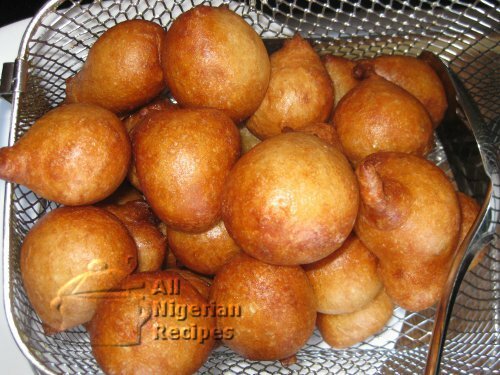 Nigerian Puff Puff is that spongy, deep-fried, spherical snack that originated from Nigeria. It is soft and springs back to touch, you know, like when you pinch a foam sponge. We leave it to our Nigerian brothers and sisters in the United States to tell you how tasty and special this Nigerian snack recipe is. Over there, it is rare to go to a party and not eat the Nigerian Puff Puff. Making the Puff Puff recipe is both easy and complicated. Easy because the mixing is quite straight-forward and you will see proof that you are doing things right as you go along. It is only complicated when you do not follow the steps as detailed on this website. If this still fails, click here for the Easiest Nigerian Puff Puff Recipe. If your yeast is the type that looks like tiny pebbles or is like paste, mix it with lukewarm water and set aside. you will add it later when you have added water to the Puff Puff mix. If your yeast is in powder form, then add it when you add the other dry ingredients to the flour (as mentioned below). Put the flour in a bowl, add the ground nutmeg, powdered yeast, sugar and salt. Mix all these together. Add water in small quantities and mix everything by hand till you have a good blend of all the ingredients. Add the yeast you mixed with lukewarm water if applicable. Use warm water to mix the puff puff ingredients if you want it to rise faster. Keep mixing till the batter is smooth but not too watery to flow from a spoon. The mix should be much thicker than pancake batter (see video below). Cover the bowl with aluminum foil and make sure it is airtight by pressing the edges of the bowl (see video). Leave to rise for about 45 minutes. When OK to fry, the Puff Puff batter should have risen in quantity and will have some air bubbles. Pour some oil in a deep pot and allow to heat up. It's not advisable to use a deep fryer for Puff Puff because of the netting but if you want to use it, set the temperature to 170°C. When the oil is hot enough, scoop some batter into the oil with your hand by pressing the batter to come out from between your thumb and index finger. You should see the video for this technique as this is what will make your Puff Puff have a near-perfect spherical shape. When both sides are golden brown, take out the puff puff balls and place in a sieve. If you want to reduce the oil on your Puff Puff as much as possible, then line your sieve with paper towels. The paper towels help soak away the excess oil on the puff puff. That's how the Nigerian Puff Puff is made. Serve with a chilled drink. Feel free to top it up with jam and other condiments you normally eat doughnuts with.